McLaren's Lewis Hamilton says he will have to be "very cautious" during the Singapore Grand Prix to ensure he does not get involved in an accident. Hamilton will start from pole position alongside Williams's Pastor Maldonado, with whom he has had a series of collisions in the last 18 months. "There are some interesting characters around me so I've got to be very cautious," Hamilton said. "I don't want to get in his way; hopefully [he wants] to do the same." Hamilton and Maldonado collided in the European Grand Prix this season, ending the Englishman's race and costing Maldonado a chance of finishing on the podium. And last year they were involved in incidents at the Monaco and Belgian Grands Prix. Maldonado has had a controversial season in which he has been given seven penalties for driving incidents. Hamilton said: "I'm happy for Pastor. He's taken a lot of heat throughout the year. He's obviously a talented young man. "It's great to see Williams do so well. Hope they have a strong race tomorrow. As long as we get a good start, I think things will be in a good position." He added: "I hope he races for himself but he's aware that he has some championship contenders around him. "It's not all or nothing but trying to get a good result for his team - and that will be the same for me." 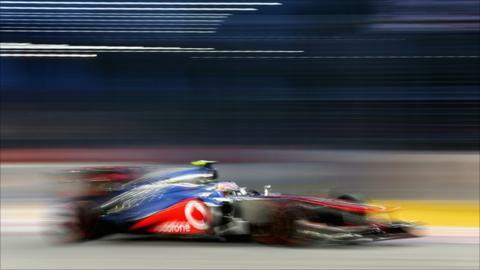 Hamilton is aiming to close the gap on championship leader Fernando Alonso of Ferrari, who is 37 points ahead of him. The 2008 champion is second in the title race, one point ahead of Lotus's Kimi Raikkonen, who qualified 12th, and two in front of Red Bull's Sebastian Vettel, who is third on the grid. "Bit by bit, I've got to try and claw points from him," Hamilton said. "He's got quite a good lead. I've got competitors quite close to me too, just a few points behind. Tomorrow is quite an important day." Hamilton's performance in qualifying was hugely impressive - he was more than half a second quicker than Maldonado - and he said he was very satisfied with what was "a really good lap". But he said he expected a tough race on the demanding Singapore track in the equatorial heat and humidity. "It's roasting," he said. "It's 30-something degrees and the humidity is high, we're in these thermal long tops [fireproof underwear], [driving] suit on and balaclava, we're sweating like crazy. I'm drinking four or five litres a day or something silly like that. The race is going to be tough."